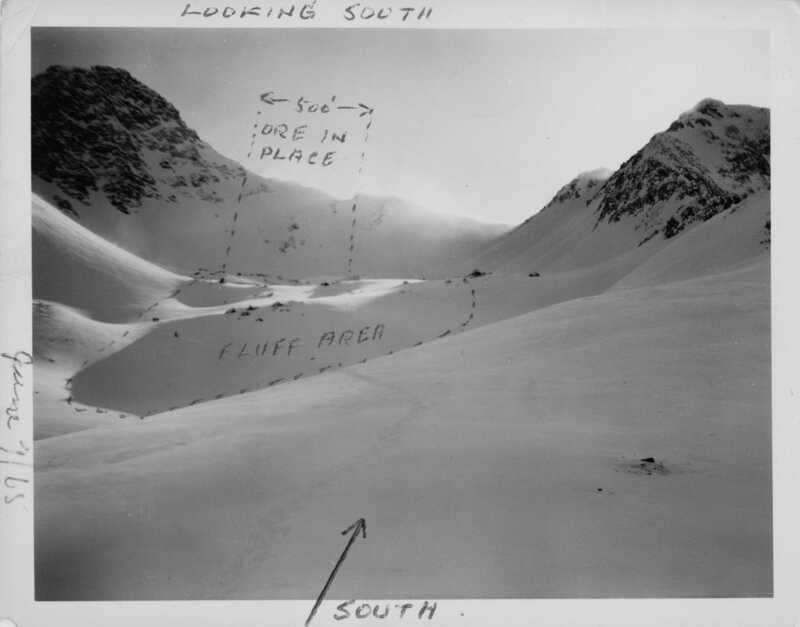 Photograph depicts the projected mining area of Asbestos Mountain, taken during the expedition of George Edzerza's party and their exploration of the future mine at Cassiar. Handwritten annotation on verso in blue ink describing sections of photograph which have been pointed to or outlined in blue ink: "LOOKING SOUTH" "ORE ZONE <--500'--> ORE IN PLACE" "FLUFF AREA" "SOUTH^". See also items 2000.1.1.1.3 and 2000.1.1.1.4. Handwritten annotation on verso in blue ink: "June 7/65 [sic]". Stamped annotation on recto in black ink: "-00". Original accession no. : 2000.1.254.030 [this photograph came from box 254].